Each year, hundreds of groups dedicate, hours, days and even months of preparation for the biggest stage in college a cappella, the ICCAs. The ICCAs are a shining example of group collaboration and hard work, along with being a great spotlight on where to see some truly remarkable performances. While the ICCAs are a great avenue for what your group should be working to, it is in no way the only event in the country that display collegiate a cappella groups. There are dozens of events taking place across the country dedicated to the vocal arts, and that offer workshops, masterclasses, networking, and much more. 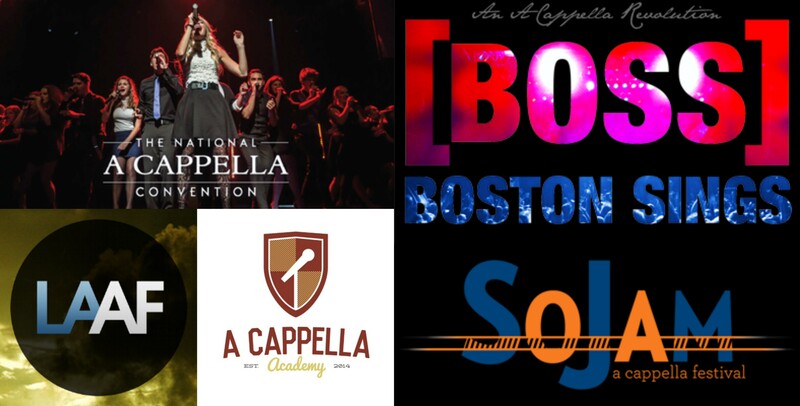 Celebrating its 14th year, SoJam is THE a cappella event in the South. Each year, the event attracts some of the best talent around to headline shows and offer hands-on workshops to help groups develop their talents from performance-based skills to the business side of a cappella. Not to mention that one of the biggest scholastic competitions outside of ICCA takes place at here. This easily one of the best events to take part in whether you're looking to compete or just sharpen your skills. Prefer your events to be closer to the sandy beaches of California? Well, the Los Angeles A Cappella Festival is for you. With a similar format to SoJam, LAAF has become widely popular for the talent featured during the professional showcase with past acts such as ARORA, The Filharmonic, and Duwende to name a few. This is another great event for high school, collegiate, and semi pro groups looking to better educate themselves on all things a cappella. A Cappella wouldn't be complete without its own version of The Grammys. Not only does BOSS feature one of the most innovative scholastic contests and a plethora of workshops on taking your sound to the next level, but it is the one event dedicated to awarding THE best in recorded a cappella music, aka the CARAs (Contemporary A Cappella Recording Awards). With a red carpet event featuring some of the biggest names in a cappella, this is the hottest event to grab a ticket for. The newest event to be added to the a cappella scene, the National A Cappella Convention has it all. Workshops, masterclasses, roundtable discussions, and loads of performances. While the competition aspect is geared more towards high school groups, college groups can walk away having made tons of connections in the aca scene, new resources for perfecting their sound, and an opportunity or two to perform a few songs. Ever wished there was a summer camp devoted to a cappella? Wish grantes. Each summer, Ben Bram (of the Socal Vocals) and Avi Kaplan (of Pentatonix) put on THE summer event that attracts hundreds of applications of soon to be college students from around the country. So, what's the appeal for collegiate singers? You get to be the camp counselors. Looking to share your expertise or simply lend a hand during this one-of-a-kind camp? Just sign up and all your dreams could come true. While this does not cover every event throughout the country for college groups looking for something different outside of the ICCAs, these are the biggest events on a national scale in the art form. Who knows, one of these events could be the thing to take your group from good to AMAZING.